Which Computer Build is Best for You? Let’s figure out which computer build is right for you. Pull up the Logical Increments builds list in a second window or tab so that you can follow along. First, let’s differentiate between demanding games and undemanding games. 2D games, simple browser, and the original Starcraft, etc, are not demanding. Any PC build on Logical Increments will play these fine. This includes many indie games and tower defense games as well. Limbo, Braid, and Cave Story, etc., will all play on almost anything. Demanding games are games with realistic graphics and lots of calculations. Battlefield 4, Far Cry 4, Crysis 3, and Skyrim are good examples of demanding games. If a game is 3D and looks realistic, it’s demanding. There are a few games that do not look realistic but can still be surprisingly demanding, such as Minecraft. Minecraft does so many calculations that it requires a fairly powerful CPU, although it doesn’t require much GPU at all. Destitute really means destitute: You want to pay more if you can possibly afford it. You will get a computer that will be great for browsing the web and reading email, but you’ll have to turn down the settings or resolution in any game more demanding than Call of Duty 2 (as in, the one from 2005). And with only 2GB of RAM, you will run into slowdowns occasionally just using Windows by having a bunch of things open at once. Minimum is minimally better, now at least including a dedicated GPU. You’re still not going to be able to make games look pretty with this, but at least non-gaming tasks will all be pretty responsive. A marginally demanding game like League of Legends will run adequately at Minimum. Entry is where things really start to pick up. You’ll be able to max out the settings on less demanding games, and at least play the more demanding games with things turned down a bit. For those short on cash but still demanding pretty graphics and “good enough” performance, the Entry tier is a good place to start. Modest and Fair will play a moderately demanding game like Call of Duty: Ghosts with the settings turned almost all the way up at 1080p at around 30 frames per second (FPS). Skyrim would be similar. 30 FPS is considered an acceptable framerate, but some people will want more. 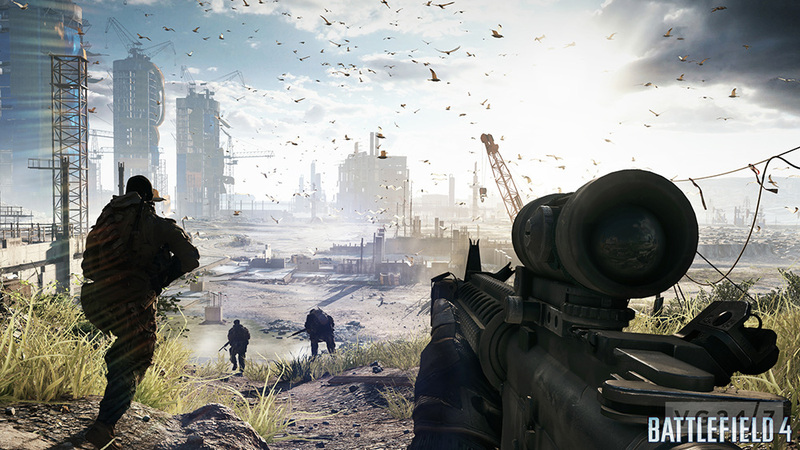 For more demanding games, such as Battlefield 4 or Crysis 3, you’ll need to keep looking at more powerful tiers. 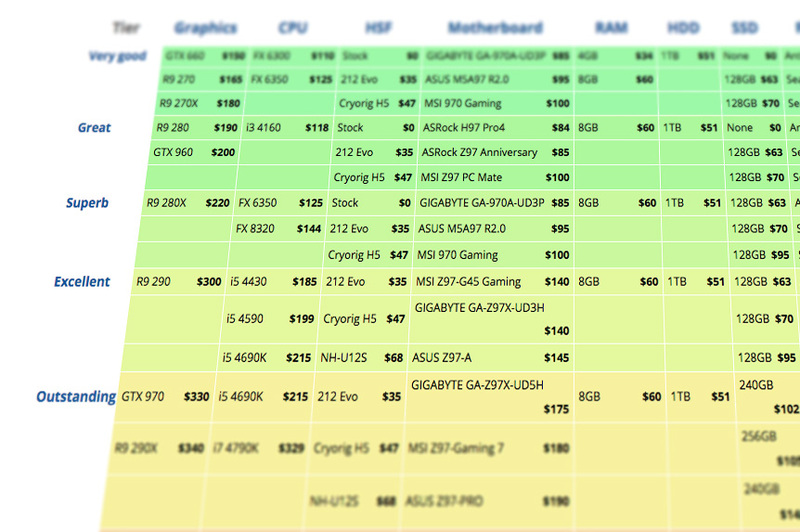 The sweet spot for performance / price is the Great tier. You’ll be able to max out most games at 1080p with close to 60 FPS and get a playable framerate with the most demanding games. Value remains really good up through the Outstanding tier, which will run almost any game amazingly well and at high framerates. VR: Virtual reality headsets must draw two frames for every one that you perceive, so you need twice the graphics power to get the same perceived FPS and smoothness. Higher framerates: If you have a monitor that refreshes faster than 60 hz (the standard LCD refresh rate) and you really want everything to be super smooth, you might need even more power. Have a specific question? Ask us in the comments.